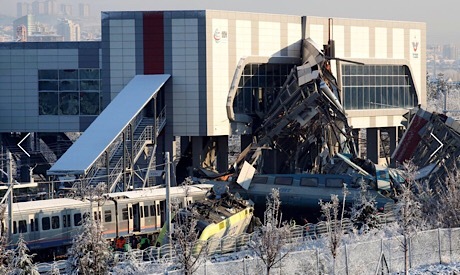 Rescuers worked to free people trapped under the mangled wreckage at Marsandiz train station, 8 km (5 miles) from central Ankara. It was not clear at which speed the train and locomotive were traveling when the collision occurred. There was light snow on the tracks. The train had been heading from Ankara to the central Turkish province of Konya and was not due to stop at Marsandiz. Ankara Governor Vasip Sahin said the locomotive, which lay battered 20 meters (22 yards) further ahead, carried out track inspections.